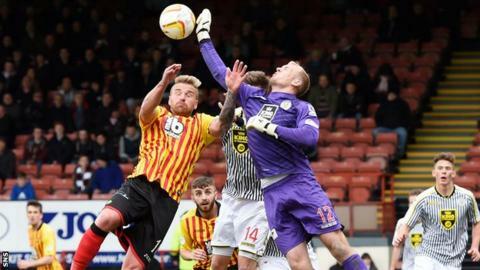 Kilmarnock have signed goalkeeper Mark Ridgers on an emergency loan from St Mirren until January. Ridgers, 25, provides cover for Killie boss Gary Locke, who is without Jamie MacDonald, Conor Brennan and Oliver Davies against Hearts on Wednesday. Ryan Millar, 16, had been put on standby to make his debut in the Scottish League Cup tie. St Mirren reserve the right to recall Ridgers from his loan spell if they encounter injuries of their own. "It has been a very difficult 48 hours for us," Locke told the Kilmarnock website. "I am grateful to [manager] Ian Murray and everyone at St Mirren for their professionalism and for allowing us to bring a player of Mark's quality in under these circumstances." And Ridgers added: "It was a bit of a whirlwind - I am really pleased to have joined Killie and to get the opportunity to play in the Premiership again." MacDonald was taken off against St Johnstone on Saturday while Davies is also injured. Brennan is ineligible, having played for Stranraer earlier in this season's League Cup. Assistant coach Lee McCulloch said earlier on Tuesday that Kilmarnock were waiting on permission to bring in one of "three or four" emergency goalkeeper options. "We have a goalie at Derby at the moment [Devlin Mackay] who we can't bring back because of the cross-border rule," he explained. "It is not ideal preparation but we will get on with it, we won't make excuses. "It is the chance to get into the quarter-finals of the Cup and keep progressing. The last couple of results [two league wins] have been all right so we want to keep momentum going." Of Millar, McCulloch said: "He could be involved. We have spoken about him so we will see what happens. He is fine. He is mentally strong and excited. "I just think you have to be really careful. If you put him in it could make his career, it could be brilliant. "But it could go the other way and destroy his mentality, if something goes wrong."